» Hey, this is NOT a dump! Hey, this is NOT a dump! This is not what you want to see from any of Albany’s riverside trails. But whether you want to or not, it’s what you had to look at the last few days on a vacant lot off the Willamette river trail from Simpson Park to Bowman Park. It looked as though somebody had emptied out his apartment or room of various kinds of junk including a chest of drawers and left this mess. This was on part of a vacant six-acre property that once housed a sand and gravel operation and later a plant making roofing shakes of cement and sawdust. The Permawood factory was started over strong neighborhood opposition in the 1980s. Later it was bought by American Cemwood, became known as Permatek and was eventually closed. The property, on the east side of the north end of Geary Street, required extensive environmental cleanup before the new owners could consider developing it. Last summer the present owners, based in Salem, had wanted to go ahead with their earlier plans to develop an apartment complex on the acreage. They met with city planners and nearby residents. The plans called for 120 apartments in three four-story buildings, with parking underneath. 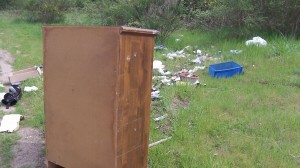 But as of this past week, the only thing that had happened on the property was that somebody used the place as a dump. Hello Hasso, – Not that there’s any excuse for someone leaving a mess like this; there isn’t. 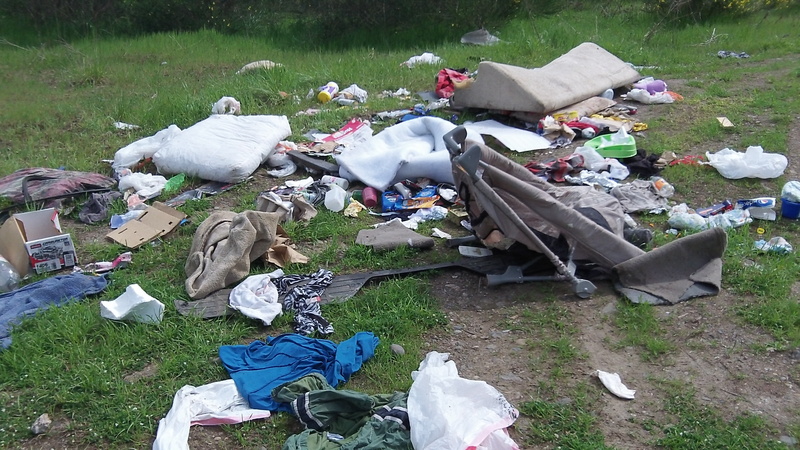 On the other hand, I was surprised when moving to Albany from Los Angeles five years ago that the city doesn’t pick up larger items of trash from house fronts and citizens are expected to carry such items to either a dumpsite or to the recycle place. Surely this policy offers incentive to dump in inappropriate places. The City of Albany and Republic Services still do The Big Pickup every year on the third Saturday in May. This year’s event is based in the Broadway neighborhood of west Albany on May 17. More information is on the City’s website, http://www.cityofalbany.net. We have plenty of clean-up projects for volunteers. Republic Services’ Recycle Roundup is also on May 17, 8 a.m.-2 p.m. at 1214 Montgomery St. SE. The company hosts a household hazardous waste collection day in October. Call 541-928-2554 for more information.